The perfect choice for families or groups of friends, Windward has five bedroom suites across two storeys, three bedrooms upstairs and two on the ground floor. The stunning master suite on the upper floor features a study, large air conditioned bedroom with king bed, full length patio accessible through french doors, dressing area and bathroom with a double vanity, tub and shower set in floor-to-ceiling marble. Two other bedroom suites are located on upstairs, one bedroom opens out through french doors to a private patio overlooking the garden and pool, while the other has views of the courtyard area. On the ground floor the garden bedroom suite has french doors to a private patio with direct access to the gardens and pool deck. Large pool deck with wet bar and bathroom facilities. Security system and security safe for valuables. Barbados is home to the world-famous Sandy Lane Hotel. It is nestled in a mahogany grove directly on a pristine, white beach, aptly known as Sandy Lane Beach. It prestigiously provides the backdrop for the surrounding estate homes that make up the villas of Sandy Lane. The hotel first opened in 1961, and to date it has gained a reputation as one of the finest resorts in the Caribbean. It is the local playground for many movie celebs and pop stars, and regularly welcomes royalty as well as the business elite. 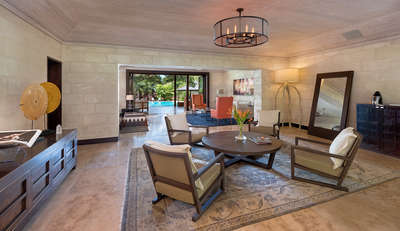 The villas of Sandy Lane Estate are known for their luxury and as a villa guest on the estate you will have access to the facilities adjoining the beach area of the Sandy Lane Hotel. You never know who you may bump into! Sandy Lane holiday homes and villas come in an array of types and sizes. Fully serviced vacation homes, they are quintessentially luxurious in all ways! Immaculate gardens with thriving plant life, a full compliment of staff composed of a security guard, gardeners, laundress, housekeepers, a cook or Chef and a butler. Within these villas, you will find the best quality amenities perhaps a baby grand piano in the living room with crystal chandeliers overhead, air-conditioned private rooms, marble tiled bathrooms, indoor and outdoor dining and entertainment space for all your friends, family and guests. The nearby Holetown area is teeming with restaurants, from casual beach bars to fine dining gourmet restaurants. The area is also well known for its duty-free shopping and nightlife.